The Sulawesi forest turtle (Leucocephalon yuwonoi) is a critically endangered species of turtle in the family Geoemydidae. It is monotypic within the genus Leucocephalon. It is endemic to Sulawesi in Indonesia. The Riverview Zoo in Peterborough, Ontario  has currently managed to hatch two forest turtles as of 2016. Forsten's tortoise (Indotestudo forstenii) – another threatened turtle endemic to Sulawesi, Indonesia. 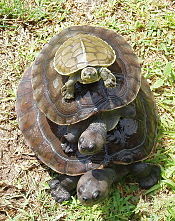 ^ Asian Turtle Trade Working Group (2000). "Leucocephalon yuwonoi". The IUCN Red List of Threatened Species. IUCN. 2000: e.T40761A97369570. doi:10.2305/IUCN.UK.2000.RLTS.T40761A10363014.en. Retrieved 15 January 2018. ^ a b Fritz Uwe; Peter Havaš (2007). "Checklist of Chelonians of the World" (PDF). Vertebrate Zoology. 57 (2): 226–227. ISSN 1864-5755. Archived from the original (PDF) on 2010-12-17. Retrieved 29 May 2012. This article about a turtle is a stub. You can help Wikipedia by expanding it. This page was last edited on 29 October 2018, at 19:25 (UTC).